The three day spectacle commenced with a mesmerizing Sundowner Party at the beautiful beachside lawns of Holiday Inn. Oriflame engaged Fountainhead MKTG, from Dentsu Aegis Network, for their biggest Directors’ Seminar event ever in Goa from the 6th to the 8th of May 2018. Having won the multi-agency pitch, Fountainhead MKTG was given the mandate to plan and execute this extraordinary 3-day event for over 1700 attendees. These included the business associates from all regions of India, East Africa and Sri Lanka, top directors, top management team of India and the Global Leaders of Oriflame. Fountainhead MKTG aimed to give all the attendees a remarkable journey of Stockholm – Oriflame’s “Home Swede Home”. The three day spectacle commenced with a mesmerizing Sundowner Party at the beautiful beachside lawns of Holiday Inn. 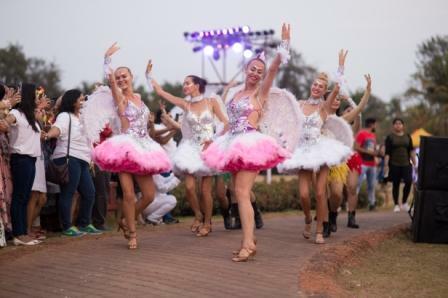 Amidst a lazy sunset over the Arabian Sea, stunning décor, fun and fanfare, the Oriflame top management surprised all the attendees by making their way onto the stage riding colourful Vespas. Themed “Home Swede Home”, the conference day showcased the beauty of Stockholm – Oriflame’s hometown, in a splendid manner right from the colourfully iconic buildings of Gamla Stan to multiple engagement spots where the audiences took thousands of pictures. This day saw a stunning and immersive conference with presentations from top management interspersed with impactful and integrated performances, launches, testimonials, fun interactions and thousands of postcards scribed by the guests to be sent to the founding brothers back home. Terming the awards night as “Turning dreams into celebrations” was wonderfully amplified with immersive audio-visuals, intelligent technicals, stunning performances and innovative recognition ideas! Overall, the event gave a magnified view of how it feels to have one’s dream come true and turning this dream into an epic celebration such as this.